KIMBERLY MIGUEL MULLEN Dance Classes THIS SUNDAY and MONDAY! TUCSON CUBA BRAZIL RESIDENCY resumes beginning 3:00 PM THIS SUNDAY with Polyrhythmic Dance Technique (to prerecorded Cuban folkloric rhythms - outstanding recordings with master artists in Cuba), followed the same day by Afro Brazilian Inspired Movement at 5:00 -6:30 PM as well as on Monday 7:00 - 8:30 PM - with LIVE drumming by Sol Axe and friends! This will be an opportunity to dive deep into the movement lead by world dance ethnologist and choreographer Kimberly Miguel Mullen! All classes at Rhythm Industry Performance Factory, 1013 S. Tyndall Ave.
Sol Axé welcomes the return of Rosangela Silvestre for another incredible residency! Come and experience the discovering of your body capacity, and the expression of movement connected with Symbols and the aspect of Nature while you are training in Silvestre Technique. We welcome the return of Kahlil Cummings , who will be offering an Afro Brazilian Drumming workshop, and visiting guest drummer Michael Paff from Samba Colorado. Local Tucson musicians Alfredo Quiahuitl Emiliano Villegas, Kimberly Madison, Sol Axé drummers and more will be part of the axe for this residency. 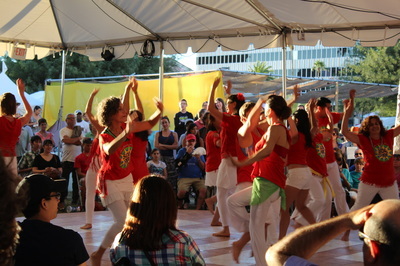 A study of the connections between the rhythms and the traditional movement, archetype and story, of the Orixa dances interpreted as an art form. Discover how sacred symbolism inspires the body to dance. Orixa is the Essence of the Universe. A continuously evolving contemporary dance technique with the objective of conditioning the dancer through physical and expressive training - regardless of level or previous experience. The Silvestre Technique brings to dance training a connection with the physical body and its connection to the Universe, which Silvestre calls, "the Body Universe." You are the Essence of the aspects of Nature that can activate and bring alive the Nature of the dance that you are. Explore inspired movement and technique in the actual Elements of Nature - in our Sonoran Desert! This class has evolved from the islands off the coast of Salvador, to the big island of Hawaii, and we have the opportunity to experience it in our own element. www.silvestretraining.com – please visit her website for her international trainings and schedule, including her intensives in Brazil in January and August, as well as appearance at California Brazil Camp. New Orleans Dance Festival; and dance camps such as the California Brazil Camp each year. She choreographed numerous dance pieces for companies based in Brazil - Balé Folclórico da Bahia and Odunde - as well as Cleo Parker Robinson Dance Company, Ballet Hispanico Repertory Company, American Academy of Ballet, Roots of Brazil, Dance Brazil, Viver Brasil, Muntu Dance Theater, and the Kendra Kimbrough Dance Company. Her dance investigation and constant development created an opportunity to connect with the eclectic American musician Steve Coleman, with whom she traveled to diverse countries which have African roots in their music and dance. With Steve Coleman, Rosangela developed an idea to have the body as an instrument that provides the movement-form of any sound that can be captured - thereby discovering and creating dance at any moment. Rosangela is currently the choreographer of Viver Brasil Dance Company Directed by Linda Yudin and Luiz Badaró. "Voices of Nature" recorded and produced by Mike Zecchino at The Nail Recording Studio in Tucson, Arizona. Visit CD BABY to listen and purchase. Join us for an incredible residency! Rosangela Silvestre returns to Tucson for her Spring Residency! For the first time, Sol Axé welcomes master drummer Kahlil Cummings, music director for Viver Brazil (LA)! ​LAST CLASS - BRING SKIRTS! SAMBA de RODA - the roots of samba! AFRO BRAZILIAN DRUM WORKSHOP with KAHLIL CUMMINGS! Kahlil Cummings, a Los Angeles native, is an acclaimed drummer, exceptional performer, composer, and educator. Kahlil was recognized as a child prodigy very early; since childhood, he has played with numerous reputable groups including Ballet Folclórico Do Brasil, Sona Sané, Abalayé, Mila Samba School, Inu Olorun, Debbie Allen Dance Company, Les Amazones, and Viver Brasil. Kahlil honed his rhythmic gifts with noted teachers including Mestre Amen Santo, Jose Ricardo Sousa, Kobla Ladzekpo, Esteban “Cha Cha” Bacallao (Ibae), and Sandy Perez. His studies in Guinea, Brazil and Cuba have helped to widely broaden his knowledge and musical strength. Sol Axé is honored to welcome Viver Brazil music director and LP percussionist, Kahlil Cummings to Tucson! Join the Sol Axé community drum ensemble and learn Afro Brazilian rhythms! We'll be learning with the intent to share the rhythms with the Tucson community thorughout the year. This is a great opportunity to be part of sharing the collective joy through drum and dance! Instruments provided, but if you have a Brazilian or African instrument, feel free to bring. In this workshop, Kahlil will be sharing his extensive knowledge of Afro Brazilian and Candomble inspired rhythms. He is a master at teaching in the community setting to people of all ages and musical abilities, from youth on up. His style is engaging and full energy, and his intention is all about building community and honoring his teachers and mentors. We will all come away with the ability to play music together with collective joy, and with respect to the culture that inspires the rhythms we learn. 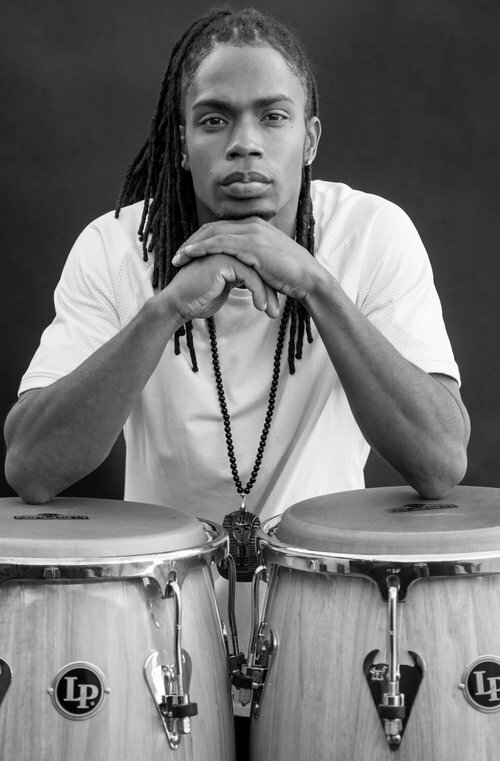 In addition to his extensive professional work with African, Brazilian, and Cuban music, Kahlil teaches community drumming classes in the LA neighborhood where he grew up. 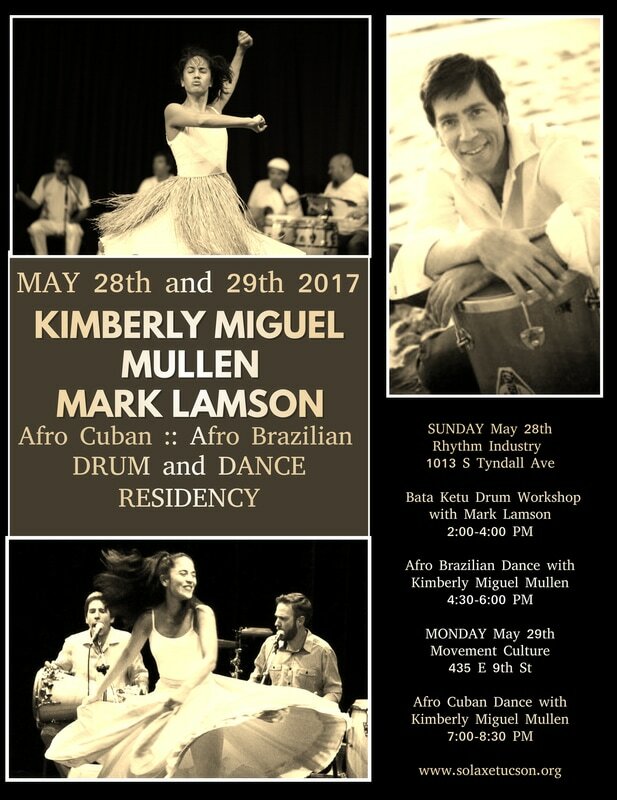 ​Kimberly Miguel Mullenand Mark Lamson bring their years of collaboration with Afro Cuban and Afro Brazilian music and dance. Come join the co-creator of the landmark CD, Bata Ketu, MARK LAMSON for a workshop that will take you through the musical and cultural connections between Cuba and Brazil. Mark is a master at getting everyone of all levels playing as he orchestrates the group through the folkloric rhythms on instruments from both cultures. $15 for two hour workshop. We welcome back KIMBERLY MIGUEL MULLEN to Tucson for her amazing dance classes! Sunday's class will focus on the Afro Brazilian inspired movement, with LIVE drumming led by Mark Lamson, and joined by Sol Axe and Tucson community drummers. Live Drumming led by MARK LAMSON and Tucson community drummers! Join KIMBERLY MIGUEL MULLEN for an energetic Afro Cuban dance class exploring the polyrhythmic movement and folkloric rhythms of Cuba! With countless recordings and performances to his credit, Mark Lamson is highly sought after for his integrity, experience, and expertise in a broad range of musical styles. While Mark’s repertoire includes R&B, rock, latin jazz, New Orleans brass band, funk, country and hip hop, his true mastery and passion lies in fusing the popular and traditional music of Brazil and Cuba with modern American and Latin American styles. One of Mark's greatest achievements to date has been the creation, recording and performance of Bata Ketu with San Francisco musician, Michael Spiro. Conceived as a fusion and interplay of Afro-Cuban and Afro-Brazilian folkloric music, Mark and Michael produced the CD in 1996, and it is hailed around the world as being a landmark recording. It is registered with the Smithsonian Institute and has received funding from the Rockefeller Institute. Kimberly Miguel Mullen, an internationally acclaimed choreographer and dance ethnologist, has performed in the USA, Brazil, Puerto Rico, Trinidad and Tobago, Cuba and Hong Kong. As a solo artist, she was one of a chosen few to perform with the late legendary Cuban percussionist Francisco Aguabella. The Los Angles Times has described her movement as “spectacularly supple,” a well-crafted mixture of Silvestre contemporary dance and traditional techniques from the African diaspora. 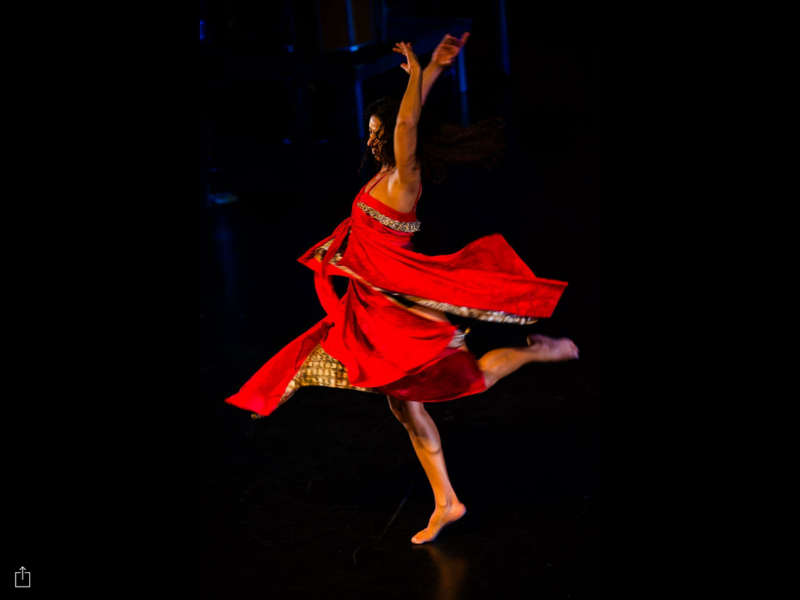 Mullen, who earned a Master of Arts degree in Dance from UCLA’s Department of World Arts and Cultures actively pursues her interests in dance ethnography and traveling throughout the world while creating links among cultures through the expression of dance. Based in Los Angeles, Mullen offers spirited and educational dance classes, workshops, retreats, and cultural immersion programs worldwide. Mullen is a University dance professor at Occidental College since 2006 and has taught at University of California Los Angeles, Loyola Marymount University, California State University of Los Angeles, and Portland State University. Since 2005, Mullen has been recognized as a popular dance and fitness DVD personality and choreographer renowned for infusing traditional dance forms into mainstream markets. Her debut dance workout DVD, “Dance and Be Fit: Brazilian Body,” was awarded “Best Dance DVD” by Health Magazine in 2009. Sol Axé will once again be performing at the Tucson Meet Yourself festival​! Come out and support wonderful musical groups and amazing food from the Tucson community! For many years, this drum and dance community in its many carnations, has had the privelage of sharing Brazilian and World inspired drum and dance at TUCSON MEET YOURSELF! JOIN US this Friday for awesome drumming and dance inspired by Brazil! THIS SUNDAY is DANCE CLASS! Continue with the fun from Friday by joining us for Sol Axe Dance Class with LIVE Drummingtaught by Esteban Sanchez! This Sunday we will be doing samba reggae and samba afro. Along with finding the deep grounded movements, we will concentrate on smoothly bringing out the power that comes from the two styles. ALL SOULS PROCESSION JOIN US! Beginning on TUESDAY, OCTOBER 11th, we'll be getting ready for the ALL SOULS PROCESSION. Four (4) Tuesday Rehearsals - Come DRUM or DANCE to the Samba Afro Rhythms! Includes instruction, use of instrument, and t-shirt! The theme this year is the The Hunter and the Hunted. For * the Hunter* we'll be wearing green for the Orixa Oxossi the Hunter. We are a project under MANY MOUTHS ONE STOMACH and it's an honor to be part of this event, and to support it, every year. Rosangela Silvestre returns to Tucson! A rare Fall Residency opportunity! Returning to the US from Salvador after her August Intensive, Rosangela spent a week at California Brazil Camp and will be coming from residencies in the Bay Area. For the first time, we welcome drummer/ CBC accompanist and student of master teacher, Jorge Alabe, Mark Machina. Joining Mark will be Solidarite Sympa to create an incredible energetic fusion for the Orixa Inspired Movement. Saturday, September 24th - SAMBA de RODA! 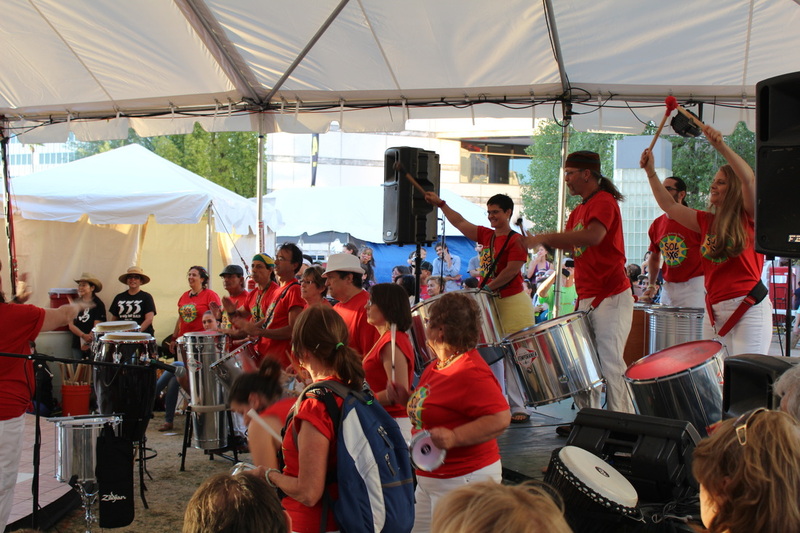 Come learn Samba de Roda the way Rosangela learned - bring a skirt if you have one! POTLUCK! Bring a dish to share! Let's connect through this community dance! This fall, Silvestre Technique classes will be an invitation to DIVE DEEP. Skill level is less important than the willingness to truly BE PRESENT and OPEN to being strongly encouraged to see what you can DISCOVER about yourself within this movement. You will be expected to leave your hesitation at the door. PLEASE RSVP for the specific Technique classes you will be attending HERE! Please visit www.silvestretraining.com for in depth information about Rosangela's work all around the world. 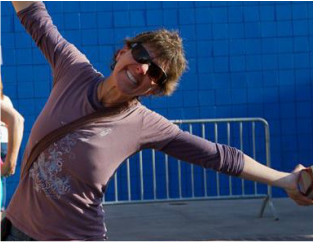 ​JOIN US for Rosangela Silvestre's return to the TUCSON directly from Brazil, her first stop for 2016! Sol Axe is proud to welcome our teacher and friend, and to be in collaboration with Capoeira Malandragem's Southwest Regional Batizado and drummers in the Tucson Community. For those considering coming from out of town, there will be a lot happening in Tucson: Silvestre Residency, Capoeira Malandragem - UCA Tucson SW Regional Batizado 2016 , and MoCtoberFest Spring Carnival. You know how things go! Magic happens with collaborations! This is going to be an amazing week! Final details on some locations and times, as well as any additional classes will be updated here, so please continue to check back frequently! For WEDNESDAY and THURSDAY Classes - Two classes Wednesday! This class will be at an advanced level. Performers, teachers, prior experience studying with the Silvestre Technique. Hosted by Artifact Dance Company with live music. Class hosted by Body Works Pilates and space is limited so please RSVP/prepay if you are coming from out of town/want to secure space. Friday - 4/1 5:00-7:00 PM- ADVANCED LEVEL Silvestre Technique with Artifact Dance Project - Live Music! In conjunction with advanced perofrmers and teachers at Artifact, this class is for those who teach and perform at an advanced level. We kick it off with a Procession with Flam Chen at 6:30 PM! Our Show Follows the Procession! Come see our show, "Ashe! Ache! Axe!" - a journey through the traditional rhythms of the African Diaspora to modern day Africa, Cuba, and Brazil. Drumming, song, and dance! Collaborations with Guillermo "Bubba" Faz, and Robert "Swami" Peizer. PROCESSION with FLAM CHEN Stilters - 6:30 PM on the Mercado Grounds! You'll be able to hear us! Brian Lavern Davis was raised in Portland, Oregon, and his musical studies have taken him to India, Japan, New York, Puerto Rico, Turkey, Jamaica and Brazil. His teachers include Jorge Alabe, Carlinhos Pandeiro de Ouro, Obo Addy, Yacub Addy, Jose Ricardo Santos & Ballet Folklorico do Bahia, Colin Walcott, Michael Spiro, Keith Terry, Los Muñequitos de Mantanzas, Bruno Moraes ( Mocidade Indepente de Padre Miguel), Jorge Martins (Maracatu Estrella Brilhante de Recife), Marcos Suzano, and Nana Vasconcelos. He has served on the faculties of Portland State University, Jefferson Performing Arts High School, and The Vancouver School of Arts & Academics, and conducted residencies at The Naropa Institute, Reed College, Lewis & Clark College, and many others. Brian is an original touring and recording member of Pink Martini ( 10 CD's, 1DVD, numerous world tours), is the founder and Director of the Lions of Batucada, an ever growing Brazilian dance and percussion ensemble, and formed and directs the “Ainsworth Jr. Escola,” a 117-member youth samba bateria (Portland, OR, USA, 1999 - present). He has toured and/or recorded with jazz legend Herbie Hancock, Pink Martini, Kalapana, Upepo, Obo Addy, Dub Squad, McKinley, Nu Shooz, Dan Reed Network and the show “BataKetu” among many others. He has performed with a variety of symphonies across the U.S., Canada, and Europe - including the Boston Pops, The San Francisco Symphony, The National Symphony at the Kennedy Center, The BBC Concert Orchestra at Royal Albert Hall,The Los Angeles Philharmonic at the Hollywood Bowl, and The Oregon Symphony --- at venues ranging from Carnegie Hall to LA's Walt Disney Concert Hall. Brian served as the conductor for the nationwide Oregon Big Beat event, 2010/ 11. His group the Lions of Batucada has shared the stage with David Byrne, Sean Lennon, and Fundo de Quintal among many others. The Lions have performed and collaborated with The Oregon Symphony, The Los Angeles Philharmonic, The Dandy Warhols, and rock legends Aerosmith, among others. They have recorded with Pink Martini and Pink Martini featuring The Von Trapps. He has worked extensively with numerous dance companies in the U.S., including Do Jump Theater, Oslund & Co. , and Linda K Johnson. When not touring with Pink Martini, he teaches body percussion and samba throughout the Pacific Northwest as part of the Young Audiences of Oregon and Washington program, teaches each Summer at the California Brazil Camp (2005 - present), and conducts samba workshops for a variety of baterias, schools, and music stores across the U.S., Taiwan, Beijing, China, Japan, Australia, and New Zealand. Recently inducted into the Hollywood Bowl Hall of Fame with Pink Martini (June 2014), he has contributed articles to DRUM Magazine (July 2013), and was featured in an interview/focus piece in Drumhead Magazine (issue #29, September/October 2011). Brian is sponsored by LP percussion (Latin Percussion). Miguel Bernal Nodal is the principal percussionist for Conjunto Folklorico Raices Profundas and has been with the group for sixteen years. Established in 1975 by Juan de Dios Ramos Morejon, raices Profundsas is on of the most hightly acclaimed Yoruban conjuntos in Cuba. Miguel toured with Japan, Mexico, Europe and South America with Raices. Mr. Bernal is one of the most sought after bataleros (player of the bata drums) in Havana. We recognize Miguel not only as a unique talent in the music community, but also as a hightly respected teacher. He has conducted numerous educational workshops in Rumba, Bembe, Guiro, and the cycle of the Congo (Makuta, Palo, Yuka) in the U.S. including universities in Montana, Colorado, Arizona, Nebraska, Oregon and California. Now in our 7th Year! MONSOON MANIA was born to throw a party in order to raise funds for members to attend CALIFORNIA BRAZIL CAMP. Camp is a place where we go to study with master music and dance teachers from Brasil and beyond, and we bring all that back to share with the Tucson Community! It is the best immersion in the music and dance culture of Brasil, without actually traveling to Brasil itself! We also use funds to cover our expenses, as well as share a percentage with our parent group MANY MOUTHS, ONE STOMACH, the organizers of the ALL SOULS PROCESSION. OPEN HOUSE for SOL AXÉ SUMMER SESSION! Come and JOIN US next Tuesday, May 12th! We will be having an OPEN HOUSE for people to come and learn all about joining our group for our summer sesson leading up to our BIG fundraising performance MONSOON MANIA! Come listen to us play and dance, learn about the instruments, get a chance to try instruments and learn some dance moves. We'll tell you how it all works, our big event plans, as well as our "band camp for grown ups" -California Brazil Camp. The OPEN HOUSE is free, and if you decide to JOIN US for the SUMMER SESSION (June and July) and pay on Tuesday, you can come to rehearsals and dance class for the rest of the month of May at NO ADDITIONAL FEE! Our PARENT GROUP - MANY MOUTHS, ONE STOMACH gets a portion of all proceeds! This helps to support the ALL SOULS PROCESSION WEEKEND! Summer Session with SOL AXE! SATURDAY, AUGUST 1st PERFORMANCE - MONSOON MANIA! Every Sunday Dance Class included! Mark your calendars for APRIL 13-20, 2015. ROSANGELA SILVESTRE returns from BRAZIL! Come join us as we open up the evening for the exciting downtown, night time, 2nd Saturday CARNAVAL event! The SusieB Birthday Bash of the Century--the Big 5-0! *This is a family-friendly event with Live music 3:00-830pm and an International Women's Day benefit for some of my favorite, premier Tucson not-for-profits that empower women and girls. *Suggested Minimum Donation at the door: $10 (two five-spots), one for the bands, one for the NPO's. The band line-up features a handful of my favorite and former bands, all guaranteed to make you wanna SHAKE THAT THANG! 4pm Key Ingredients of African Soul--local wizards of Shona (Zimbabwe), West African High Life, Soukous, Reggae, and all things Mike Olson aka Doc Twang! 6pm Sol Axé --Brazilian drumming and music that will inspire joyful, ecstatic, smiling wide-as-the-sky dancing, I promise. 7pm Mitzi Dasheya Cowell and her band, and Gary Mackender and his band, Black Skillet Review, will mash it up blues and New Orleans style 'til we close the place down. SOL AXE at TUCSON MEET YOURSELF! It's time for Tucson Meet Yourself and a GLOBAL CARNAVAL! JOIN US on SATURDAY, OCTOBER 11th, beginning at 6:00PM! We will be parading with the rhythms of Maracatu up to the Church St. Stage, and then performing a rocking set of Brazilian grooves! Also part of the Carnaval will be Odaiko Sonora, Axe Capoeira, Flam Chem, Sticks and Fingers...it's going to be an AMAZING SHOW!!! 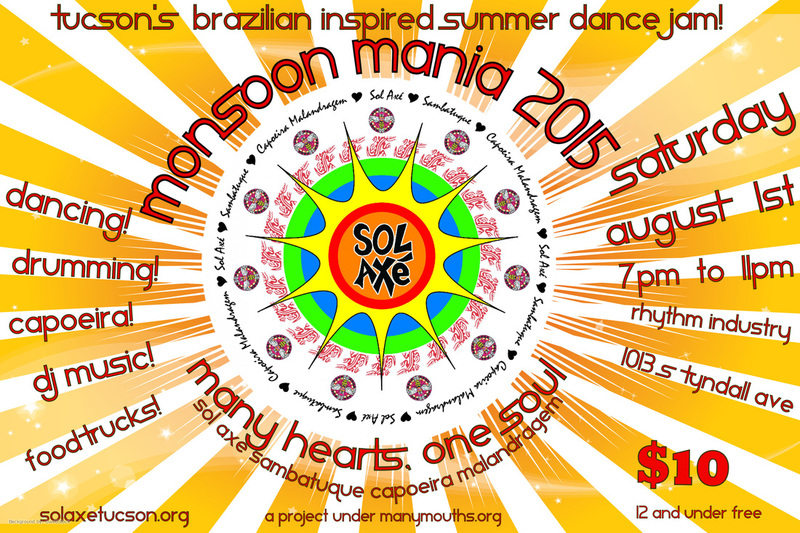 SOL AXÉ to Host 6th ANNUAL MONSOON MANIA DANCE JAM FUNDRAISER! Got bell bottoms? Got some platform shoes? Because we got SOUL...as in, a "SOOOOOOL TRAIN" to California Brazil Camp! Tucson, AZ July 16, 2014: It is that time of year again when people are looking for fun, family friendly activities to do in the middle of the Sonoran Desert summer. 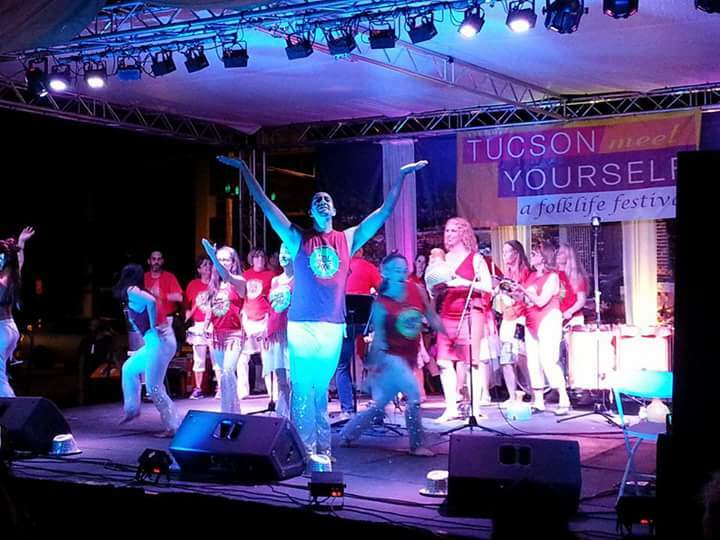 For the 6th year in a row, Tucson’s Brazilian Inspired Drum and Dance community will be hosting just such an event: MONSOON MANIA DANCE JAM and FUNDRAISER! This year our theme will be inspired by hit show “SOUL TRAIN”! WE WANT COSTUMES inspired by that show’s late 70’s/early 80’s era of funk! Sol Axé will be performing a rocking set, along with their sister group Sambatuque from Flagstaff (www.sambatuque.org), a fantastic Capoeira demonstration by Capoeira Malandragem, stilters from Flam Chen, and plenty of 70’s Soul Train era dance jams to keep everyone dancing between performances and right through to the end. Remember the Soul Train Dance Walk? Start practicing your moves to stroll down that line! JOZARELLI’S Italian Street Food and DC JUMBIE Latin Fusion will be the fantastic FOOD TRUCKS on hand to keep you going! This is a family friendly event, so bring a friend! Kids 12 and under are free. MONSOON MANIA DANCE JAM and FUNDRAISER! Sambatuque Samba School of Flagstaff, Capoeira Malandragem, Flam Chen Stilts, DJ Jams and Food Trucks!